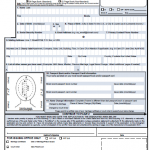 A DS-82 application is the passport application form you will use only if you need passport renewal. Passport is not damaged and it can be submitted with your DS-82 application. Your current passport was issued when your were 16 years old or older. Your current passport was issued within the past 15 years. Your name has not changed since your current passport was issued or if it has you can provide a legal document to support the name change (i.e. court order, marriage certificate, divorce decree, etc..). When you are asked if you have been issued a US passport before you must put your current passport numbers in here. This will allow the system to distinguish that you are a renewal and create a DS-82. If you do NOT include this information it will automatically print a new application instead of a Renewal. The next page you come to is going to allow you to create a PDF of your application and print it. To do this simply scroll to the bottom left hand corner where it says Create Form. You must check the computer fraud box above it before it will let you create the form. From there it will create a 6 page PDF. Although it is six pages, page 5 and 6 are the actual application. You can print out your application and sign it.